Butter Garlic Naan is a very popular flatbread. 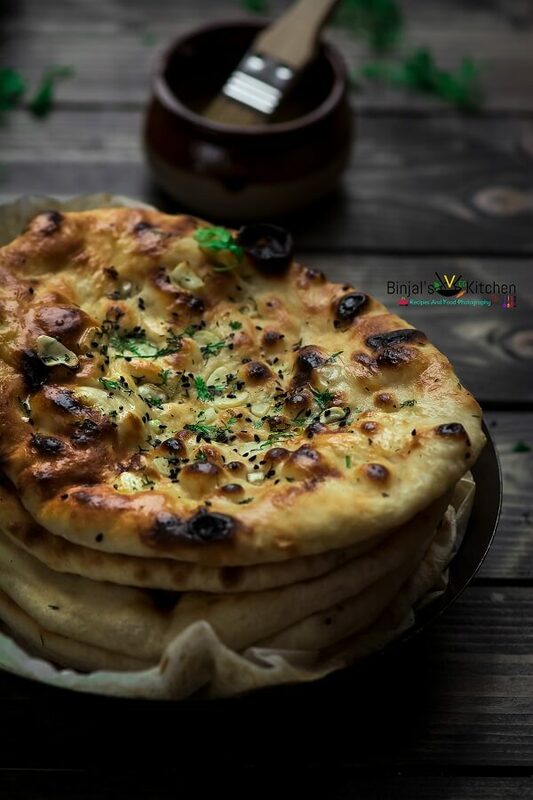 Butter Garlic Naan can be made with or without tandoor (oven). Butter Garlic Naan easily and readily available in Western countries too. 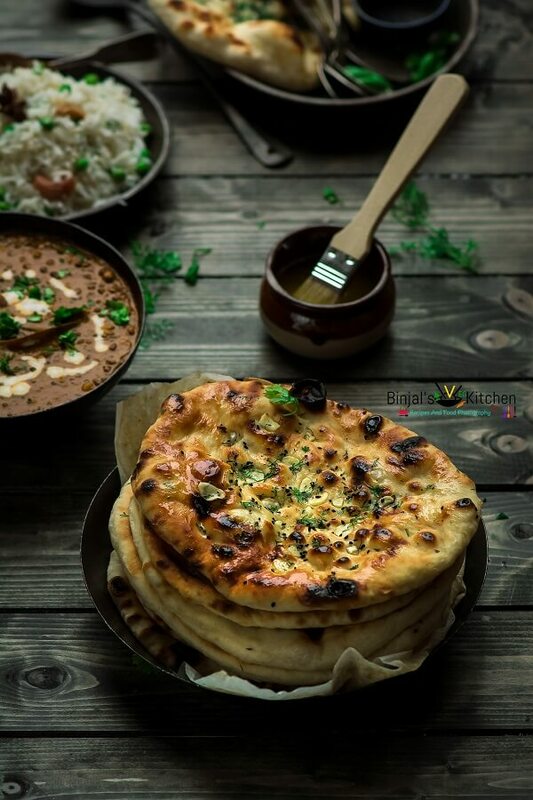 Butter Garlic Naan is most familiar in the South Asian countries like India, Pakistan at in all restaurants and roadside dhabas. It does not carry any special significance, as it is merely the generic word for any kind of bread. In other parts of South Asia usually refers to a specific kind of thick flat bread. Usually it is cooked in a tandoor, from which tandoori cooking takes its name called tandoori naan. Typically, it serves hot and brush with ghee or butter. However, I made this without oven, tandoor with my favorite garlicky flavor. This version is sometimes prepared as a fast food. It can also be dipped into soups as dal, and goes well with sabjis/curry. 1. Take a large bowl; add dry yeast, sugar, 3/4 cup warm water and cover the bowl for 10 minutes (come out bubbly or foamy). 2. Now Add garlic paste, butter, salt and mix well. Add 3 cups flour and knead it to make smooth, slightly sticky dough (use Water as needed). 3. Turn the dough on the floured kitchen surface and knead about 5 minutes using your hand. 4. Grease the bowl and place the dough in it. Cover the dough until its size doubled or 35-40 minutes. 5. After 40 minutes punch the dough and knead it, then divide it into medium sized balls(about 10-12). 6. Now hit the tawa or griddle on medium flame, then take a one ball, apply some crushed garlic, chopped coriander leaves and kalonji, then roll out the ball into an oval or triangle shape using dusting flour. 7. Turn rolled naan upside down, then apply little water on Naan, and then place watery side of Naan on hot tawa/griddle, so it sticks easily on tawa. 8. After few seconds bubbles will come out on the surface, cook for 1-2 minutes. 9. Turn the tawa upside down direct on the flame and roast all side of the Naan directly on high flame till golden brown spotted. 10. Now remove it from the tawa, apply melted butter immediately. 11. Use the same process for the rest of the dough and make soft, crispy Naan on the stove top without tandoor or oven. 12. 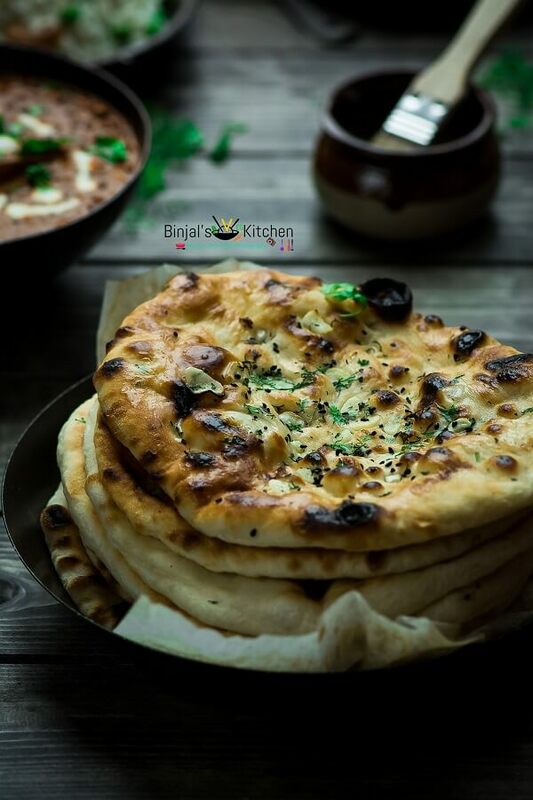 Your Butter Garlic Naan without Tandoor is ready, Now Serve hot with any Indian curry or subji. • Use 1 tsp baking powder + ¼ tsp baking soda + ¼ cup curd and reduce half quantity of water as a substitute of yeast. • Always use good quality of yeast. • If you are a beginner then don’t use nonstick tawa/Griddle, use without nonstick, so your Naan stick easily on tawa. Take a large bowl; add dry yeast, sugar, ¾ cup warm water and cover the bowl for 10 minutes (come out bubbly or foamy). Now Add garlic paste, butter, salt and mix well. Add 3 cups flour and knead it to make smooth, slightly sticky dough (use Water as needed). Turn the dough on the floured kitchen surface and knead about 5 minutes using your hand. Grease the bowl and place the dough in it. Cover the dough until its size doubled or 35-40 minutes. After 40 minutes punch the dough and knead it, then divide it into medium sized balls(about 10-12). Now hit the tawa or griddle on medium flame, then take a one ball, apply some crushed garlic, chopped coriander leaves and kalonji, then roll out the ball into an oval or triangle shape using dusting flour. Turn rolled naan upside down, then apply little water on Naan, and then place watery side of Naan on hot tawa/griddle, so it sticks easily on tawa. After few seconds bubbles will come out on the surface, cook for 1-2 minutes. Turn the tawa upside down direct on the flame and roast all side of the Naan directly on high flame till golden brown spotted. Now remove it from the tawa, apply melted butter immediately. Use the same process for the rest of the dough and make soft, crispy Naan on the stove top without tandoor or oven. Your Butter Garlic Naan without Tandoor is ready, Now Serve hot with any Indian curry or subji. Delicious butter garlic naan you got the bubbles on the top correctly without tandoor . It looks perfect.